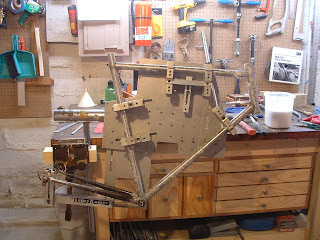 Here's the parts for Henrik' frame. I did a little fancy cutting, but nothing too crazy. 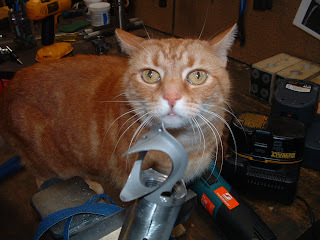 I have to be careful because the inspector is always watching and checking out my work. She won't let anything slip by and she's constantly busting my chops. The fixture set up and ready to tack. 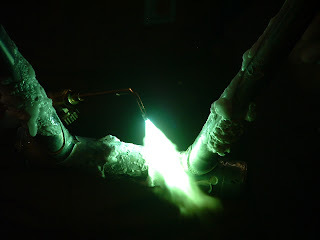 Now the for cool green flame. 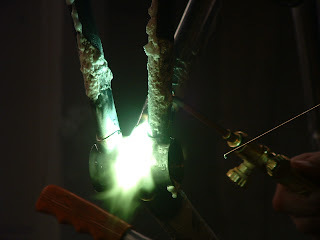 Lisa took a huge pile of pictures last night of me brazing the first frame. For a rookie, she did a really nice job! 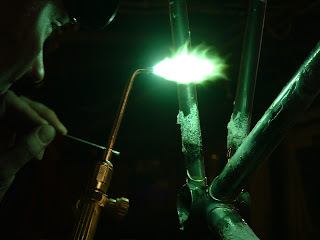 Here I'm just cleaning up my lug lines on the bottom bracket. A little more on the bb shell. 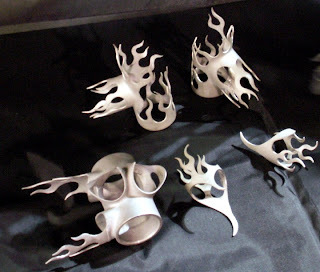 A nice one of the head lugs with the flame wrapping around. Well, that's all for now, I'll have more of the frame once I do some finishing later today or tomorrow. 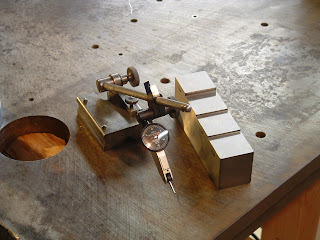 The alignment plate is ready to go, and bike #1 is in progress. 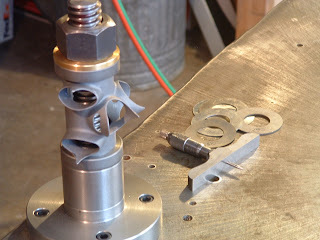 Here's the bottom bracket post for the plate, in the background you can see the shims and depth micrometer. I decided to use a setup like this because I can adjust the height of the shell depending on how much material I face off during machining. Once the bottom bracket is perfectly centered the rest of the system is pretty straight forward. Here you can see the rest of the components of the plate. 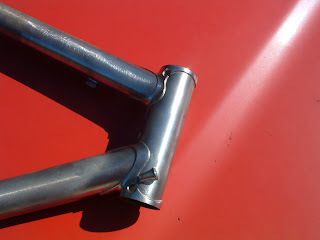 The long bar goes through the head tube and has two reversible cup for 1 1/8" and 1" head tubes. The blocks it's resting on are set to check for twist and height. I had a 27.2mm stub made and mounted on the angle block for the seat tube. 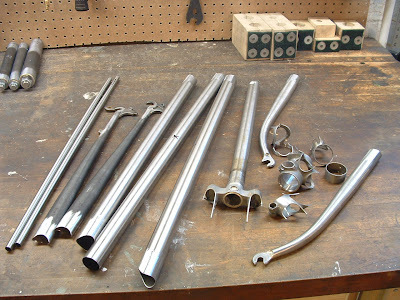 this way if I do an over sized seat tube I just need a larger stub made and can mount them interchangeably. Finally, for checking the rear spacing, I've got the cool surface gauge I found on Ebay and a dial indicator that a friend rebuilt for me. 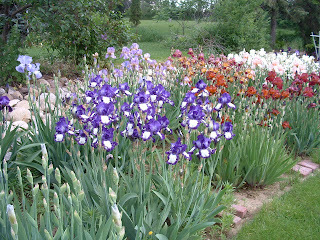 The block at right has steps for 120, 130, 135, and 140 spacing. All I do is set the indicator at the desired height, check the lower dropout face, and use a caliper to set the final spacing. Works nice. 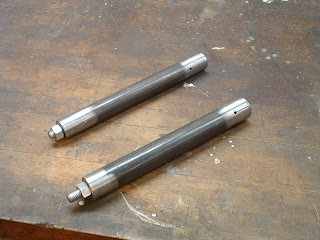 I also put together some lug mandrels for holding the lugs during carving and grinding. They're basically a piece of tubing with a wedge at the business end attached to a threaded rod that I can tighten on the other end. Took a while to grind the wedge just right, but I used them today and so far, so good. In case any folks out there are planning on attending Frostbike at QBP (Quality Bicycle Products) I will be there as well. My brother's making some Ellis Cycles t-shirts, so if you see one and want to know more feel free to ask. It'll be my first visit to Quality, and I've heard it's and impressive operation, looking forward to checking it out. On to the shop, I'm set to pick up all my alignment plate parts tomorrow from the machine shop, I'll post photos once everything is put together, but now the only thing I'm waiting on are tubes for frame #1. I ordered an extra set for my own bike, a single speed road bike. I'll post photos of both bikes as they come together, and get more up on the website. Here's some shots of a frame I built for my sister-in -law Maggy last fall. The head lugs are pretty basic just thinned out and the little circle cutout in the corner. Simple, but I love that look. 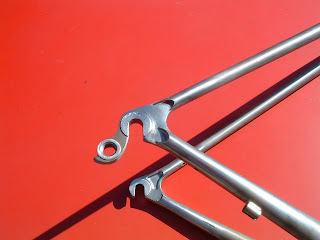 The rear dropouts are Ritcheys, but I ground them back quite a bit and did a little artsy touch on the ends. 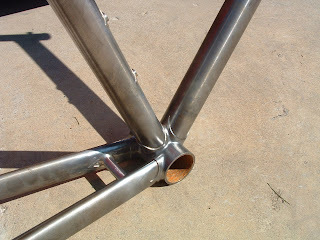 The bottom bracket, I like the little reinforcements on the chainstay bridge. 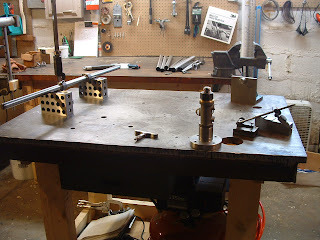 I talked to the machine shop today and they should have my alignment table parts ready on Wednesday. One thing ahead of schedule! Got a torch on Saturday and routed the hoses down into the basement, just need some tubes now and things are ready to roll. I'm ready to talk about prices and delivery, so if you're in the market for a frame I'd love to hear from you. Thanks again to everyone who has helped me this far! Well, as I'm writing this we are being pummeled by a major blizzard. Lisa and I have now shoveled the driveway 3 times and it's still coming down. Probably 10" so far. 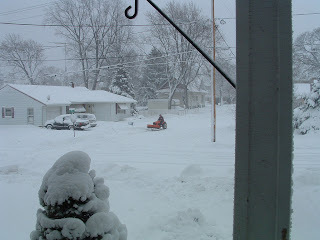 You can see our neighbor on his trusty plow, unfortunately we're still using shovel technology, and running out of places to put the snow. As far as Ellis Cycles is concerned, I am incorporated as of last Friday. Now I just have to get insurance and I am a for real business. My brother Steve has also made progress on the website, I now have the domain name elliscycles.com registered and the site is soon to follow. Had some good conversations with tubing suppliers this past week as well, I hope to be keeping them busy soon. Dropped off drawings for my alignment plate fixturing at the machine shop on Monday, they were really helpful and hopefully I'll be getting the parts back by the end of next week. 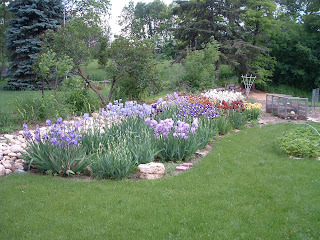 Just for a little taste of spring I thought I'd leave you with some photos of the iris garden that inspired my logo.